This interview also appears on Uvi Poznansky’s blog ..
Why did you write Remote Control? I began Remote Control because I had been writing screenplays in American voices and I wanted to write something closer to my own voice. I was raised in England so I wanted to write British characters. I started writing what was to be a two-man multi-media stage-play. Harold and Fred were two British ex-pats who lived on the upper floors of a cheap hotel in Los Angeles in the 1980’s. They watch television and become the characters they watch. The stage would be simply divided into three areas – on the left, an old worn couch facing the audience; on the right a small kitchen table with two chairs. Up center would be a huge rear projection 10′ x 15′ screen which would use a combination of slides and video to provide a variety of abstract and/or realistic images as a backdrop to support the scenes. 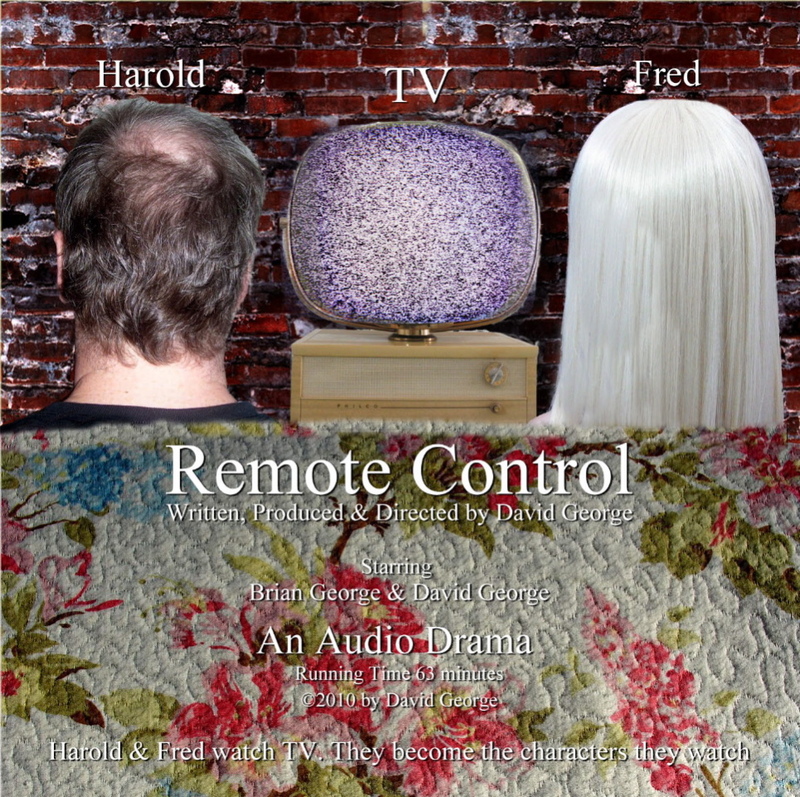 So, Harold & Fred would begin a conversation on the couch and at the appropriate moment at the end of the scene one of them would aim a TV remote at the audience and click! The lights would fade on the couch and an image would appear on the screen and Harold or Fred would stand before the screen and become whoever they were watching on Television. So this was the conceit, that the whole piece would play out as if they were channel surfing – and the action would unfurl like flipping channels. I wrote the whole thing in a flash – about six weeks. The whole play came out complete like “automatic writing” – I was possessed. The structure allowed it to be dramatic, funny, tragic, surreal. I didn’t really know what I had until around page forty – I suddenly understood what I was writing, but I can’t reveal that here so you’ll have to listen to the audiobook/radio dramady! I should say here that there are drums – African tribal drummers that play us in and out of the scenes. The significance of this will be shown later. At its core, this is a love story, not only between Harold & Elena, but between the two characters Harold & Fred. Tell us a little about the twists and turns of the story? Fred reveals in an opening monologue that he fears he might be a woman trapped in a man’s body. He’s not sure about this but desperate, he indulges the possibility and wears a dress, sloppy make-up & stays in the apartment in preparation for the big event. Harold indulges him – they are old friends. Harold has been secretly writing letters to Elena, a woman he met through the personals in the local paper. Since he has decided he will never meet her, he writes fantastic stories about his life that are pure fantasy. Elena we learn is a caregiver, taking care of her ailing mother. After a while Elena begins to fall in love with the dashing man in her letters. Harold hides the letters from Fred but one day, Fred finds Elena’s letters stuffed under the cushions of the couch and reads them. Fred is shocked and amused, hurt and threatened all at once that Harold has had this secret. Later when Fred reads that Harold & Elena are planning to meet, Fred writes a letter in Harold’s name (unknown to Harold) canceling the proposed meeting. How did you go from a stage play to the audiobook? Well it occured to me much later that this could work as a “radio play” without much adjustment. So I decided to produce it myself with music and sound effects. My brother Brian George (Babu on Seinfeld, The Indian father in Big Bang Theory) agreed to play Harold and other multiple roles; I would play Fred and other multiple roles. I had written Harold for Brian to play and he was familiar with the role. HAROLD: Dear Elena, when I was in Africa I had an opportunity to sky dive which I naturally ‘jumped’ at the chance to do. I have to tell you this has to be one of the most exhilarating experiences I’ve ever had. Have you ever tried sky diving? The most wonderful feeling is to leap out of the side door of that small aircraft. I remember preparing to jump, the loudness of the twin engines vibrating the body of the plane: the density of the wind blowing outside the door. The air is as thick as…cheese! You get a definite sense of what’s holding you up. I can’t remember actually leaping out, but there I was in a free-fall – arms and legs outstretched. The roar of the engines diminished to a distant hum, and then…silence. I was now facing a mountain range to the south, and beyond the mountains I could see the ocean shining like a sheet of blue glass. I pulled the cord. The rustle of silk and rope: then a whoosh! The harness dug in as my body lurched and the chute opened! I floated down to earth as it rushed up to greet me. A new perspective. Trees towered above my head. I was knee-deep in tall grass, and the sound of the African birds filled my ears with their wild song! Elena, you should have been there! WayfairSanford Reliability and sleek, contemporary design. Ideal mechanical pencil for home and office use. No-slip grip provides greater control while writing.